Page Generator Pro allows you to automatically produce location based Keywords. These keywords contain a list of locations (terms), based on some basic criteria that you provide – for example, all cities within a region / state, or all ZIP Codes in a radius of a starting point. Don’t see the Generate Locations option? It’s new to Page Generator Pro 1.7.8 and higher. Ensure that your license is valid, not expired and that you’ve updated to the latest version of the Plugin. Keyword The template tag you’ll use when generating Pages / Posts / Custom Post Types. This must be unique, and not a template tag you’ve already defined. Output Type Defines the data that you want to use from each Location, storing it as a Term against this Keyword. To change the order of existing selected fields, drag and drop them. Note: Not all options above will be available, depending on the other options chosen. For example, Distance is only available when Method = Radius. Country The country that you’ll be generating Locations within. The area method will populate this Keyword’s Terms with all Locations that fall within the given area constraints. The radius method will populate this Keyword’s Terms with all Locations that fall within the given Radius from the given Starting City / ZIP Code. This method is useful if, for example, you / your client offers services within a specific radius of your business location. Starting City / ZIP Code Define the central starting point. 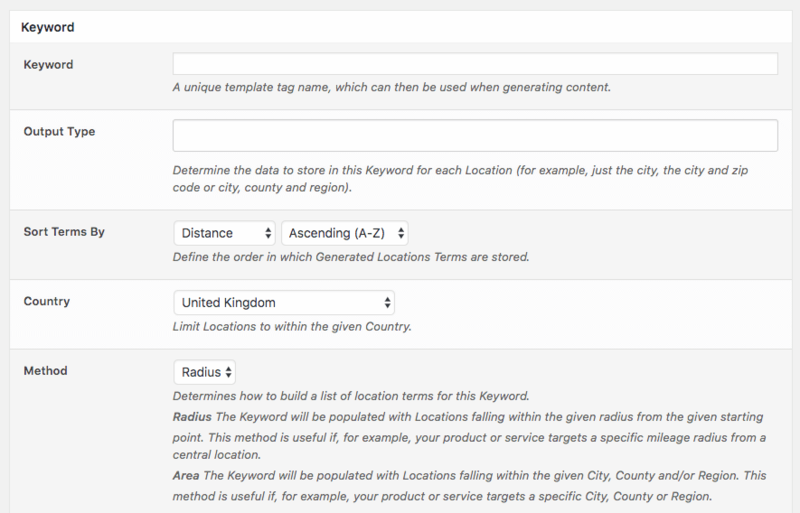 This is used in conjunction with the Radius option below, and will define a circular area from which all Locations will be added to this Keyword’s Terms. Radius The number of miles from the Starting City / ZIP Code to search for Locations. 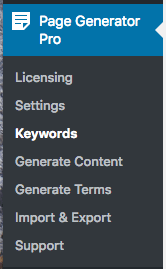 Any Locations found will be added to this Keyword’s Terms. This method is useful if, for example, you / your client offers products or services within a specific Region(s), County(s) or City(s). Restrict by City / Cities Locations will only be added to the Keyword’s Terms if they match the given City / Cities. Restrict by County / Counties Locations will only be added to the Keyword’s Terms if they match the given County / Counties. Restrict by Region(s) Locations will only be added to the Keyword’s Terms if they match the given Region / Regions. Exclusions Any Locations partially or fully matching the given strings will be excluded from the Keyword’s Terms. For example, to exclude Mobile Parks from Location results, you’d enter mobile parks. The following examples are typical / more common use cases for the Generate Locations functionality, but are not exhaustive. For example: generate a list of ZIP Codes within a 10 mile radius of Birmingham, UK, storing the Terms by nearest to furthest from Birmingham, UK. For example: generate a list of ZIP Codes within a 100 mile radius of B1 2JB, UK, storing the Terms by furthest to nearest from Birmingham, UK. For example: generate a list of Cities and ZIP Codes within a 10 mile radius of Birmingham, UK, storing the Terms by ZIP Code, A to Z. For example: generate a list of Cities and ZIP Codes within a 100 mile radius of B1 2JB, UK, storing the Terms by ZIP Code, Z to A. For example: generate a list of ZIP Codes in the City of Birmingham, UK, storing the Terms by ZIP Code, A to Z. For example: generate a list of ZIP Codes in the Cities of Birmingham, UK and Manchester, UK, storing the Terms by ZIP Code, Z to A. For example: generate a list of ZIP Codes in the County of West Midlands, UK, storing the Terms by ZIP Code, A to Z. For example: generate a list of ZIP Codes in the Counties of West Midlands, UK and East Midlands, UK, storing the Terms by ZIP Code, A to Z. For example: generate a list of Cities and ZIP Codes in the County of West Midlands, UK, storing the Terms by City, A to Z. For example: generate a list of Cities and ZIP Codes in the Counties of West Midlands, UK and East Midlands, UK, storing the Terms by City, Z to A.